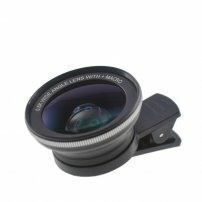 37mm Cloth-Clip 0.60X Wide Angle Lens (+ Macro Lens) for iPhone / iPad / Samsung, Google SmartPhones [CAM005971] : Onchee.com - the accessory shop for all your handheld Electronics! This is a wholesale site, you will need to login and get approved before you can make purchase. Thanks! To use the lens set is as easy as putting a clip when you are hanging clothes to dry. Just press, align with your camera and release, then you can use. It comes with 0.60X super wide angle lens (the macro lens comes with the wide angle lens, not an independent lens). Whenever any one lens is to be used, just screw it on then you take fantastic pictures with your camera phone! The clip is also compatible with some of other 37mm lenses in our shop too (please make sure we specify so)! - The advantages are that you can share those 37mm thread lenses for your SLR or DSLR and and the same time and also have a filter on the front thread. - Easy to use: A simple clip setup, which makes it easy to remove and place onto a device. - Universal, fits to almost all the smart phones as long as it can clip and align with the camera. - Apple iPad Pro 11.0"
- Samsung Galaxy Note 7"
- Samsung Galaxy Note 7.7"
- Samsung Galaxy Note 8.4"
- Samsung Galaxy Note 8.9"
- Samsung Galaxy Note 10.1"
- Samsung Galaxy Tab 7.0"
- Samsung Galaxy Tab 8.0"
- Samsung Galaxy Tab 8.5"
- Samsung Galaxy Tab 8.9"
- Samsung Galaxy Tab 10.1"
- Samsung Galaxy Tab 10.5"
- Samsung Galaxy Tab Pro 12.2"
- Samsung Galaxy Note Pro 12.2"
- Other colors are available upon request / MOQ. - We have more lenses for your smartphone, just type lens type on the search box, then you can find more lense fit for your applications. - Photos attached are for reference only, it may be slightly varied in items of colour, shape from the actual item delivered from time to time). - Please assume the cloth clip is NOT compatible with lenses we sell alone, please make sure we did specify so or check with us before checkout. - Net Weight: 70g approx.